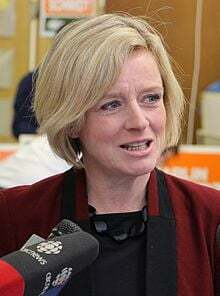 This letter has also been published as an open letter titled Rachel Notley’s Alliance with the Enemies of Tenure, Peer Review, and Academic Freedom at Alberta’s Universities in the American Herald Tribune, as well as at Global Research. Is your opinion about what is, or is not, “reflective of Alberta” to become a new test of how curriculum will be created and how faculty members will be chosen in this province? There are serious implications for academic freedom and free speech in this province when an Alberta Premier chimes in about the need to reflect her own own conception of Alberta values in higher education. What lies behind your decision to disseminate a caricature of me “standing at the head of the class” in order to “spread lies and conspiracy theories”? Since I began teaching in the Department of Native American Studies at the University of Lethbridge in 1990, I have never once seen a student evaluation that reflects the kind of accusations you are pressing publicly on me. How is it you think you know more about me, including what goes on in my classroom, than my own students? After a year and a half of being subject to a ruthless trial-by-media, a new process is only now being initiated that from my perspective allows me to come forward for the first time to tell my side the story before an investigating tribunal operating within the terms of our collective agreement. The process is going forward because of a court contestation that the U of L Board of Governors lost because of its unwillingness to adhere to the laws of labour relations in Alberta. If you would actually take a genuine interest in my academic work, Premier Notley, you would realize I have a record of studying all sorts of genocide and condemning this crime against humanity in all its manifestations, including in the Jewish Shoah. You might have taken into account that in 2004 I won the Wilfred Eggleston Award for the best work of non-fiction by an Albertan author. In its review of this work, The American Empire and the Fourth World, Alberta Views described the volume as “the first truly important Canadian book of the century.” It appears, Premier Notley, that you are contributing to making Alberta a dangerous and unwelcoming place for authors, artists and scholars that don’t stick to the party line on government-dictated orthodoxy. Perhaps the people who lied to you about me in late August of 2016 are still holding you captive in terms of filtering the information that has caused you to think whatever it is you believe you know about me. The President of the University of Lethbridge, Dr. Michael J. Mahon, went along with the Facebook deception to suspend this tenured full professor on Oct. 3 and 4, 2016. I was pulled from the classroom in mid-term and banned from stepping foot on campus. This purge took place entirely outside the terms of the collective agreement between the university’s faculty and administration. Are you even aware of this central fact in the academic freedom case at the University of Lethbridge? What is your view, Premier Notley, of the condemnation directed at the new NDP federal leader, Jagmeet Singh, when B’nai Brith Canada took aim at him for intervening to provide a venue at the Ontario provincial legislature for a presentation by academic advocates of the rights of educator Nadia Shoufani. The condemnation directed at the current NDP federal leader came about in late Augusts of 2016 when Mr. Singh was MLA for the riding of Bramalea-Gore-Malton and Deputy Leader of the Ontario NDP. Similarly, the effort to criminalize Ms. Shoufani and bar her from the classroom anticipated the similar treatment to which I was about to be subjected later in 2016. The attack on Ms. Shoufani’s job and her reputation was based on allegations about her supposed “terror-supporting remarks” made in a Quds Day speech in Toronto in July of 2016. Now in Feb. of 2018 B’nai Brith Canada has resumed its efforts to quarterback the NDP, lobbying aggressively to stop a resolution from being put on the floor of the recent NDP convention. The vote, nevertheless, was close, 189 for putting the resolution forward and 200 for sidelining it. The resolution included provisions on a Canadian boycott against products produced in the illegal Israeli settlements in the Occupied West Bank. Those supporting the boycott resolution included the unanimous backing of the Young New Democrats, 28 electoral riding associations covering six provinces, and many current and former MPs. Geneviève Nevin, a supporter of the resolution from Victoria, observed, “There’s a generational divide on this issue.” In his account of this divide within the NDP, journalist Derrick O’Keefe suggested Jagmeet Singh would be wise to look to the example of Jeremy Corbyn in the UK. Mr. Corbyn has mobilized on behalf of the Labour Party considerable electoral support from his attentiveness to the plight of Palestinian people under Israeli occupation. By siding so strongly with the U of L administration’s collaboration with the Israel lobby including B’nai Brith Canada and the Centre for Israel and Jewish Affairs, you have identified yourself and your government with agencies that condemned Hassan Diab wrongly as a terrorist. B’nai Brith Canada played a major role in calling for pulling the sociology teacher from his Carleton University classroom in Ottawa. This intervention helped set in notion a miscarriage of justice that saw the Lebanese Canadian academic incarcerated for a decade in Canada and France for a crime he didn’t commit. You have identified yourself and your government, Premier Notley, with notorious enemies of academic freedom who brought forward during the 50thanniversary of York University all sorts of false allegations much like those I am facing now. This fiasco unfolded when B’nai Brith Canada, the CIJA, the Canadian Jewish Congress and the Jewish Defence League tried to shut down an academic conference on Israel/ Palestine at York University in 2009. The effort to sabotage this academic initiative was foiled because the York University President, Mamdou Shoukiri, and the York University Board of Governors stood up for the imperatives of academic freedom. In 2018 in Alberta the equation is very different. The President and Board of University of Lethbridge have adopted the position of the Israel lobby. Now, Premier Notley, you have intervened to strengthen this political coalition favouring the stifling of free and open debate at Alberta universities. Please consider revisiting your provocative and intellectually bankrupt position on this matter.